We identify with what we look like, with our faces. We also identify with the conditioning of our minds, the ways in which we have been trained to think and feel, with values, with habits acquired in our lifetimes, and so on. But, beyond the conditioned realm is the unconditioned, the unborn, the uncreated, something without form, quality, or quantity. This is where everything ceases, and our abilities to imagine and perceive end. By speaking in this way, however, we still create images of the conditioned and unconditioned! For most people the conditioned is all they ever really relate to, the unconditioned remains a kind of metaphysical belief, or some abstraction they might accept. And some do not even consider it. Even in metaphysical doctrine the unconditioned is given conditions. So, we give God attributes; we give God all kinds of qualities which are, of course, conditioned. An attribute, a quality, a quantity, is ‘born’, ‘created’. We are all very involved with the realm of mortality and what is conditioned is mortal, subject to death, or cessation. At the end of our lives, we shall all inevitably experience death when the body stops functioning, when the heat element dies out and the body disintegrates. A reflection on life is that it is. We can describe life, write poetry about it, try to define it, but what is it? It is like this. Being able to breathe, being conscious, conscious breathing, feeling, is life. Being involved in breathing, consciousness and feeling, until the body dies, is a lifetime, a human life span. The tendency of Western materialism is to emphasize the importance of the death-bound conditions, even though we wouldn’t put it like that, would we? We would say we were emphasizing life — life is important. We want to live! How we live is also considered to be important; we feel we should be free to do what we want, to develop and have all kinds of rights, privileges and experiences. Life is the important issue. But life itself means death because we can’t have life in this realm without death. So we begin to question whether there is life after life, or a transcended form of life. Right now, however, what we are involved in is life on the feeling, sensory plane. This is what hits us during this life span, isn’t it? What we are constantly being confronted with is impingement from the conditioned realm. That is what eyes, ears, nose, tongue, body, brain and nervous system are all about. And yet, from the primitive to the present sophisticated forms of humanity, there has always been a sense outside of the senses, or an intuition that there is something beyond, something transcen­dent. And this is often speculated about, or believed in; we form metaphysical doctrines about, say, a realm after death, or transcendent truth, or the immortal, or the eternal, the infinite. Immortality is something that each one of us can realize but can never prove. We have no way of holding it up, of capturing it, preserving it, or proving it to anyone else. In other words, each human being is quite capable of realizing ultimate reality, immortal truth, and yet not one of us is capable of proving it to anyone else. If human beings are not encouraged to realize this truth for themselves, they either go to some authority, or expert on the subject, and accept what they say, or they simply dismiss the whole thing as being totally irrelevant to their lives. So we can just dismiss the subject, and this is probably what most of us do. Instead, we get involved in other important social, economic and political issues that we devote our lives to. Now the Buddha was a sage who tried to convey a particular teaching that would encourage the realization of ultimate reality. And the teaching of the Buddha sometimes baffles modern humanity because it does seem somewhat strange to our way of thinking; we are used to regarding religion from the point of view of being told something. A sage, or philosopher, or some prophet tells us something, and we either agree with it or not; or maybe we are like the agnostic — not quite sure. Not too many people are absolutely sure, on the negative or on the positive side. This symbol of the Buddha, then, — the knower, the ability of a human being to know the truth, — is most significant for us at this time. This particular way of knowing, or Gnosticism, was, it seems, all destroyed at one time in Western civilization. An attempt was made to destroy every bit of Gnostic literature, except it kind of keeps creeping in, doesn’t it? They keep finding things, like the Gnostic gospel, in old clay pots in caves that have been overlooked all these years! Now, the word ‘gnosis’ is related to the Pali word ‘nyana’, which means ‘inside knowledge’, ‘direct knowledge’; it’s not abstract knowledge, it’s not knowledge about something, it’s direct knowing. 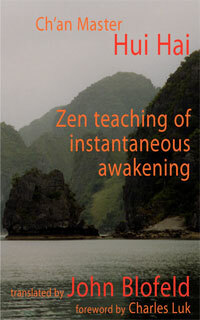 Direct ‘knowing’ of the human mind is the whole purpose of the Buddha’s teaching. 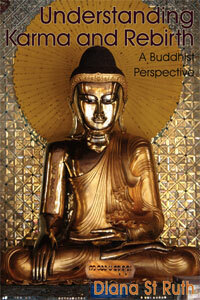 When people ask me why I became a Buddhist, I tell them it was because of this oppor­tunity. I felt that if there was God, or an ultimate transcen­dent reality, or an immortal, it could be known directly. If there is an ultimate truth, then we have to realize it. Now, admittedly, gnostic forms can be quite dangerous because in some ways anybody can believe almost anything. We can believe in the silliest ideas. And we need to have a way of pointing to this direct knowing, a way of talking about it that isn’t just subjective. Maybe there is no agreed way of talking about it, or maybe the ability to use perception is never the same; after all, it is something that each one must realize. When one does realize it, then one tends to describe it with the particular perceptions one has, whether they be Buddhist, Christian, Muslim, Hindu, or whatever; one uses what one has, to describe ultimate reality. Because of that, we hear some very strange expressions of it. In the Buddhist convention, we take our own direct experiences and weigh them against the teachings of the Buddha; we measure experiences through the conventions we have. So there’s an agreed way of talking about it. And this the Buddha was very careful about. 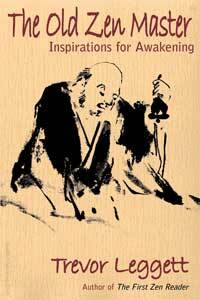 Bhikkhus and Bhikkhunis were totally forbidden to talk about their insights from a subjective place. There is no way we can let a monk say, ‘I am an enlightened person,’ or ‘I have realized ultimate truth.’ Such statements are forbidden. If we claim this and it is not true, it’s a disrobing offence. If we are mad and say it, it is not an offence! But, if we make such a claim to the lay community and it is true, it is still an offence. ‘I have realized,’ ‘I am enlightened,’ ‘I am a stream entrant,’ ‘I am this,’ ‘I am that,’ is something that is considered an inappropriate way of speaking. The Buddhist way is never from this position of ‘I have realized,’ or ‘I have experienced this insight.’ We use the formula ‘there is’. The Buddhist teachings are, ‘There is suffering; there is the end of suffering; there is the conditioned; there is the unconditioned.’ We never say, ‘I am the unconditioned,’ or ‘I am an immortal being,’ because it is inappropriate in the Buddhist convention. Now, this is sometimes baffling because many people feel that Buddhists are not enlightened any more because they never say so. Back in the seventies Westerners used to go round Thailand looking for enlightened masters. Finally, they would say, ‘There aren’t any!’ That was because nobody proclaimed himself to be such. 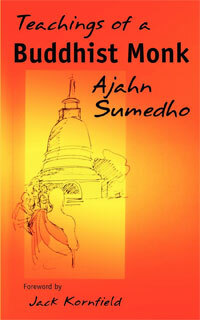 If a Buddhist monk claims he is enlightened, we have to beware of him because he is not a proper monk! But does that mean there aren’t any enlightened beings? We are thrown back on ourselves, and this is the Buddhist way; it is the way of looking at ourselves, of developing mindfulness, rather than of going around trying to find out whether someone else is enlightened, or not. When the Buddha was sitting under the bodhi tree and realized truth, he knew he was enlightened. After a while he thought, ‘This is too subtle; there’s no one I can possibly think of who’s going to understand what I’ve realized. It’ll be better if I don’t even bother to find anyone; I’ll just sit here under this tree, maybe go off to a cave or something.’ But then, according to the scriptures, Brahma Sahampati, a radiant being who obviously had great compassion for us, would always interrupt whenever the Buddha started thinking in this kind of way and say, ‘Now listen, there are those with only a little doubt; there are human beings who will understand if you but seek them out and make yourself available to them.’ And so the Buddha said, ‘Well, yes, you’re right. I’ll do that.’ Then he thought, ‘Who do I know who will understand?’ And he considered his previous teachers, but by the power of his own intuition, immediately knew that they had both died. Then he decided that maybe the five disciples who had deserted him just before his enlightenment might understand. He left Bodh Gaya, where the bodhi tree is, and on his way to the Deer Park near Benares, happened to meet another ascetic who recognized his aura of purity. The ascetic said, ‘What have you realized, venerable sir?’ The Buddha replied, ‘I am the All Enlightened Buddha.’ The ascetic was a bit bewildered by this remark and said, ‘Oh! Well, good for you! Goodbye!’ Now, that was a direct and true statement. Buddha wasn’t lying, or bragging, or trying to make false claims; he was just saying in the most direct form what was true. That ‘I am’ wasn’t an egotistical ‘I am’; it was not ‘I am the body,’ or ‘I am feeling,’ or anything; it was ‘I am the transcendent I-am’; it was from wisdom; it was the universal ‘I am’. Most human beings have not realized universal ‘I am’; they are just the ‘I am’s’ of ‘I am a man,’ ‘I am a woman,’ ‘I am an Englishman,’ ‘I am good,’ ‘I am bad,’ ‘I am this . . . ‘ ‘I should be . . . ‘ ‘I shouldn’t be …” So when the Buddha taught his first sermon in Benares, he said, ‘ There is suffering; there is the origin, there is the cessation, there is the path out of suffering.’ These are the Four Noble Truths. The statements were said in the way of ‘there is’, rather than ‘I have realized and understood’. Theres nothing to think about nothing to see here that can explain in words the unknowing. Will understand. The Internet makes it easier. The eagle nebulae. Take a look.